Project Gutenberg, abbreviated as PG, is a volunteer effort to digitize, archive, and distribute cultural works. Founded in 1971, by Michael S. Hart, it is the oldest digital library. Most of the items in its collection are the full texts of public domain books. The project tries to make these as free as possible, in long-lasting, open formats that can be used on almost any computer. As of December 2007, Project Gutenberg claimed over 25,000 items in its collection. Project Gutenberg is affiliated with many projects that are independent organizations which share the same ideals, and have been given permission to use the Project Gutenberg trademark. Wherever possible, the releases are available in plain text, but other formats are included, such as HTML. Most releases are in the English language, but many non-English works are also available. There are multiple affiliated projects that are providing additional content, including regional and language-specific works. Project Gutenberg is also closely affiliated with Distributed Proofreaders, an internet-based community for proofreading scanned texts. Michael Stern Hart's vision and efforts led to the establishment of the oldest digital library. Project Gutenberg was started by Michael Hart in 1971. Hart, a student at the University of Illinois, obtained access to a Xerox Sigma V mainframe computer in the university's Materials Research Lab. Through friendly operators (Hart's brother's best friend was the mainframe operator), he received an account with a virtually unlimited amount of computer time; its value at that time has since been variously estimated at $100,000 or $100,000,000. Hart has said he wanted to "give back" this gift by doing something that could be considered to be of great value. His initial goal was to make the 10,000 most consulted books available to the public at little or no charge, and to do so by the end of the twentieth century. This particular computer was one of the 15 nodes on the computer network that would become the Internet. Hart believed that computers would one day be accessible to the general public and decided to make works of literature available in electronic form for free. He used a copy of the United States Declaration of Independence in his backpack, which he had been given at a grocery store on his way home from watching fireworks that evening. He typed the text into a teletype machine but was unable to transmit it via e-mail. Thus, to avoid "crashing the system," it had to be downloaded individually. This was the beginning of Project Gutenberg. Hart began posting text copies of such classics as the Bible, the works of Homer, Shakespeare, and Mark Twain. As of 1987 he had typed in a total of 313 books in this fashion. Then, through being involved in the University of Illinois PC User Group and with assistance from Mark Zinzow, a programmer at the school, Hart was able to recruit volunteers and set up an infrastructure of mirror sites and mailing lists for the project. With this the project was able to grow much more rapidly.his became the first Project Gutenberg e-text. He named the project after Johannes Gutenberg, the fifteenth century German printer who propelled the movable type printing press revolution. By the mid-1990s, Hart was running Project Gutenberg from Illinois Benedictine College. More volunteers had joined the effort. All of the text was entered manually up until 1989, when image scanners and optical character recognition software improved and became more widely available, which made book scanning more feasible. Hart later came to an arrangement with Carnegie Mellon University, which agreed to administer Project Gutenberg's finances. As the volume of e-texts increased, volunteers began to take over the project's day-to-day operations that Hart had run. Pietro Di Miceli, an Italian volunteer, developed and administered the first Project Gutenberg website and started the development of the Project online Catalog. In his ten years in this role (1994–2004), the Project web pages won a number of awards, often being featured in "best of the Web" listings, and contributing to the project's popularity. In 2000, a non-profit corporation, the Project Gutenberg Literary Archive Foundation, Inc. was chartered in Mississippi to handle the project's legal needs. Donations to it are tax-deductible. Long-time Project Gutenberg volunteer Gregory Newby became the foundation's first CEO. Charles Franks also founded Distributed Proofreaders (DP) in 2000, which allowed the proofreading of scanned texts to be distributed among many volunteers over the Internet. This effort greatly increased the number and variety of texts being added to Project Gutenberg, as well as making it easier for new volunteers to start contributing. DP became officially affiliated with Project Gutenberg in 2002. As of 2007, the 10,000+ DP-contributed books comprised almost half of the nearly 25,000 books in Project Gutenberg. 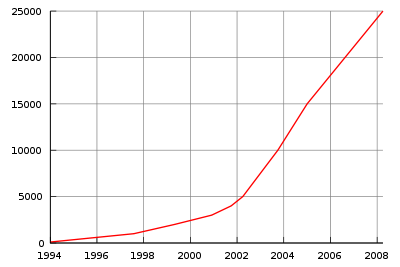 Growth of Project Gutenberg publications from 1993 until 2008. As of December 2007, Project Gutenberg claimed over 25,000 items in its collection, with an average of over fifty new e-books being added each week. These are primarily works of literature from the Western cultural tradition. In addition to literature such as novels, poetry, short stories and drama, Project Gutenberg also has cookbooks, reference works and issues of periodicals. The Project Gutenberg collection also has a few non-text items such as audio files and music notation files. Most releases are in English, but there are also significant numbers in many other languages. As of July 2008, the non-English languages most represented are: French, German, Finnish, Dutch, Chinese, and Portuguese. Whenever possible, Gutenberg releases are available in plain text, mainly using US-ASCII character encoding but frequently extended to ISO-8859-1. Besides being copyright-free, the requirement for a Latin-text version of the release has been a criterion of Michael Hart's since the founding of Project Gutenberg, as he believes this is the format most likely to be readable in the extended future. The text is wrapped at 65-70 characters and paragraphs are separated by a double-line break. Although this makes the release available to anybody with a text-reader, a drawback of this format is the lack of markup and the resulting relatively bland appearance. Other formats may be released as well when submitted by volunteers. The most common non-ASCII format is HTML, which allows markup and illustrations to be included. Some project members and users have requested more advanced formats, believing them to be much easier to read. But some formats that are not easily editable, such as PDF, are generally not considered to fit in with the goals of Project Gutenberg (although a few have been added to the collection). For years, there has been discussion of using some type of XML, although progress on that has been slow. Michael Hart said in 2004, "The mission of Project Gutenberg is simple: 'To encourage the creation and distribution of ebooks.'" His goal is, "to provide as many e-books in as many formats as possible for the entire world to read in as many languages as possible." Likewise, a project slogan is to "break down the bars of ignorance and illiteracy," because its volunteers aim to continue spreading public literacy and appreciation for the literary heritage just as public libraries began to do in the late nineteenth century. Project Gutenberg is careful to verify the status of its ebooks according to U.S. copyright law. Material is added to the Project Gutenberg archive only after it has received a copyright clearance, and records of these clearances are saved for future reference. Unlike some other digital library projects, Project Gutenberg does not claim new copyright on titles it publishes. Instead, it encourages their free reproduction and distribution. Most books in the Project Gutenberg collection are distributed as public domain under U.S. copyright law. The licensing included with each ebook puts some restrictions on what can be done with the texts (such as distributing them in modified form, or for commercial purposes) as long as the Project Gutenberg trademark is used. If the header is stripped and the trademark not used, then the public domain texts can be reused without any restrictions. There are also a few copyrighted texts that Project Gutenberg distributes with permission. These are subject to further restrictions as specified by the copyright holder. Project Gutenberg has been criticized for lack of scholarly rigor in its e-texts: for example, there is usually inadequate information about the edition used and often omission of original prefaces. However, John Mark Ockerbloom of the University of Pennsylvania noted that PG is responsive about addressing errors once they are identified, and the texts now include specific source edition citations. In many cases the editions also are not the most current scholarly editions, for these later editions are not usually in the public domain. While the works in Project Gutenberg represent a valuable sample of publications that span several centuries, there are some issues of concern for linguistic analysis. Some content may have been modified by the transcriber because of editorial changes or corrections (such as to correct for obvious proofsetter or printing errors). The spelling may also have been modified to conform with current practices. This can mean that the works may be problematic when searching for older grammatical usage. Finally, the collected works can be weighted heavily towards certain authors (such as Charles Dickens), while others are barely represented. In March 2004, a new initiative was begun by Michael Hart and John S. Guagliardo (Executive director of the World eBook Library) to provide low-cost intellectual properties. The initial name for this project was Project Gutenberg 2 (PG II), which created controversy among PG volunteers because of the re-use of the project's trademarked name for a commercial venture. All affiliated projects are independent organizations which share the same ideals, and have been given permission to use the Project Gutenberg trademark. They often have a particular national, or linguistic focus. Project Gutenberg Australia hosts many texts which are public domain according to Australian copyright law, but still under copyright (or of uncertain status) in the United States, with a focus on Australian writers and books about Australia. PG-EU is a sister project which operates under the copyright law of the European Union. One of its aims is to include as many languages as possible into Project Gutenberg. It operates in Unicode to ensure that all alphabets can be represented easily and correctly. Project Gutenberg of the Philippines aims to "make as many books available to as many people as possible, with a special focus on the Philippines and Philippine languages." Project Gutenberg Europe is a project run by Project Rastko in Serbia. It aims at being a Project Gutenberg for all of Europe, and has started to post its first projects in 2005. It is running the Distributed Proofreaders software to quickly produce e-texts. Projekti Lönnrot is a project started by Finnish Project Gutenberg volunteers which derives its name from Elias Lönnrot, who was a Finnish philologist. ↑ 1.0 1.1 1.2 1.3 Jeffrey Thomas, Project Gutenberg Digital Library Seeks To Spur Literacy, U.S. Department of State, Bureau of International Information Programs. Retrieved October 15, 2008. ↑ Michael S. Hart, A BRIEF HISTORY OF PROJECT GUTENBERG. Retrieved October 15, 2008. ↑ Michael S. Hart, Gutenberg: The History and Philosophy of Project Gutenberg. Retrieved October 15, 2008. ↑ B.H. Day and W.A. Wortman, Literature in English: A Guide for Librarians in the Digital Age (Chicago: Association of College and Research Libraries, 2000, ISBN 0838980813). ↑ Vara Vauhini, Project Gutenberg Fears No Google, Wall Street Journal. Retrieved October 15, 2008. ↑ Project Gutenberg, Gutenberg:Credits. Retrieved October 15, 2008. ↑ 7.0 7.1 Paula Hane, Project Gutenberg Progresses, Information Today 21(5). Retrieved October 15, 2008. ↑ Distributed proofreaders, The Distributed Proofreaders Foundation. Retrieved October 15, 2008. ↑ According to gutindex-2006, there were 1,653 new Project Gutenberg items posted in the first 33 weeks of 2006. This averages out to 50.09 per week. This does not include additions to affiliated projects. Retrieved October 15, 2008. ↑ Project Gutenberg, Category:Bookshelf. Retrieved October 15, 2008. ↑ Frank Boumphrey, European Literature and Project Gutenberg, Cultivate Interactive. Retrieved October 15, 2008. ↑ Michael S. Hart, Gutenberg Mission Statement by Michael Hart, Project Gutenberg. Retrieved October 15, 2008. ↑ Project Gutenberg, The Project Gutenberg Weekly Newsletter. Retrieved October 15, 2008. ↑ Ruth Perry, Postscript about the Public Libraries, Modern Language Association. Retrieved October 15, 2008. ↑ Martha L. Brogan and Daphnée Rentfrow, A Kaleidoscope of Digital American Literature (New York: Digital Library Federation, 2005, ISBN 1933645288). ↑ Sebastian Hoffmann, Grammaticalization And English Complex Prepositions: A Corpus-based Study (Routledge, 2005, ISBN 0415360498. Boumphrey, Frank. European Literature and Project Gutenberg. Cultivate Interactive, July 2000. Retrieved October 15, 2008. Day, B. H.; Wortman, W. A. Literature in English: A Guide for Librarians in the Digital Age. Chicago: Association of College and Research Libraries, 2000. ISBN 0838980813. Hane, Paula. Project Gutenberg Progresses. Information Today 21 (5), 2004. Retrieved October 15, 2008. Hart, Michael S. Gutenberg:The History and Philosophy of Project Gutenberg. August 1992. Retrieved October 15, 2008. Hart, Michael S. Gutenberg Mission Statement by Michael Hart. Project Gutenberg, October 23, 2004. Retrieved October 15, 2008. Hoffmann, Sebastian. Grammaticalization And English Complex Prepositions: A Corpus-Based Study, 1st Edition. Routledge, 2005. ISBN 0415360498. Lorenzen, Michael. Deconstructing the Philanthropic Library: The Sociological Reasons Behind Andrew Carnegie's Millions to Libraries. Modern Language Association, 2002. Retrieved October 15, 2008. Martha L. Brogan, Daphnée Rentfrow. A Kaleidoscope of Digital American Literature. New York: Digital Library Federation, 2005. ISBN 1933645288. Perry, Ruth. Postscript about the Public Libraries. Modern Language Association, 2007. Retrieved October 15, 2008. Thomas, Jeffrey. Project Gutenberg Digital Library Seeks To Spur Literacy. U.S. Department of State, Bureau of International Information Programs, July 20, 2007. Retrieved October 15, 2008. Vara, Vauhini, "Project Gutenberg Fears No Google." Wall Street Journal. December 5, 2005. Retrieved October 15, 2008. This page was last modified on 3 June 2015, at 18:46.